Twelfth Night, or What You Will, one of several Shakespeare comedies revolving around deceptive gender and mistaken identity, was originally produced in the early 1600s as part of the post-Christmas revel called, unsurprisingly, Twelfth Night. 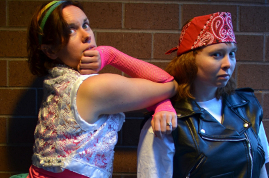 In the hands of the Rude Mechanicals, known since 1999 for their contemporary interpretations of the Bard, the play is transported to the 1980s, where gender identity becomes an open question and the excesses of the Rich and Famous are legion. (photo by Kevin Hollenbeck) The audience, welcomed to “tonight’s concert,” Illyria-aid, is thrust headlong into the post-psychedelic rock music world of neon and metal as Duke Orsino (Donald Cook), now a rock star, launches into his melancholy anthem “If music be the food of love, play on,” as he pines for the mourning Olivia (Lauren Beward). This intentional diversion, courtesy of director Maureen Shanahan, takes us into the ambiguous, sometimes asexual world of rock music, where gender and sexuality are already questionable, a context not unlike Shakespeare’s theatre, where men always played women because the law kept women off the stage. Rarely do casts who have taken on the immortal Bard have so much fun with his material. Even if the performances are sometimes uneven, the Rudes have a talent for cutting away the excess, making even the thickest text accessible to modern ears. As a rule, directors expect their audiences to suspend disbelief, and this production is no exception. In Katie Wanschura’s hands, Feste (traditionally Olivia’s jester) becomes a Cyndi Lauperesque songwriter who just wants to have fun. She leads Olivia’s merry band of fools: Sir Toby (Joe Dziekiewicz) and Sir Andrew (Joel Lorenzetti), rowdy members of Olivia’s entourage; Maria (Erica Smith), Olivia’s mohawk-crested friend; and Fabian (Josh Engel), as they take on Malvolio (Liz Armour), Olivia’s uptight and potentially malevolent band manager for a night of not-quite-harmless alcohol-driven sport. Into this world, Viola (Tory Talbot Virchow) enters as a survivor of a road bus accident in which she believes she has lost her twin brother and fellow rock star, Sebastian. Determined to survive, Viola assumes Sebastian’s form, though not his name, and takes on a new role (in disguise) as Cesario, Orsino’s servant. Meanwhile, Olivia (Lauren Beward as a vapid and shallow stage diva), becomes struck on Cesario as s(he) works to woo Olivia on behalf of Orsino, even as the disguised Viola dotes in private on her Duke. The decidedly not-dead Sebastian (Amy Rauch) meets Antonio (Joe Kubinski), who takes the boy under his dubious wing, not far from the festival site. It doesn’t take long for the pair to drift into the vicinity, with confusing and hilarious results. Talbot Virchow and Rauch make an excellent match in the twins who can hardly be told apart, especially when wearing the same costume. With an imaginative use of props (the trees become stacks of roadcases, Sir Andrew’s sword a pair of drumsticks, and his duel with the hapless Cesario a battle of voices – complete with microphones), wildly topical costumes and make-up, there’s no lack of enthusiasm in this production. The rock festival conceit mostly works, though a little unevenly. Then again, having witnessed the difference between music video perfection and actual stage performance, there is something to be said for the less-than-perfect. Some of the most entertaining asides and biggest laughs were derived from the “concert festival” setting. Though the events of Twelfth Night occur during a midsummer’s eve, the play contains all the conceits of an Elizabethan Twelfth Night‘s revels, including role reversals and upside down events, together with the Rudes’ definitely offbeat stamp. In all, an amusing evening, and generally decent entertainment for kids ages 8 and up. At the core of Twelfth Night is the idea that music is the pathway to our souls. The play itself is peppered with songs (not to mention the ones we threw in for fun), and when thinking about how to make Twelfth Night relateable [sic] to a modern audience, a music festival seemed like the natural choice to make. Most of the characters of Twelfth Night are motivated through their societal status and, in present-day United States, societal status is not usually something that will prevent marriage. However, when taken in context of the play when it was written, the lifting of Orsino’s obsession with Olivia when Viola reveals her identity makes more sense; he’s still marrying an equal. So, combined with Twelfth Night‘s musical heart-beat, it made sense to make them all stars in the music industry. Rock stars dating other rock stars is common, but dating assistants is fuel for scorn. After that, the rest of the characters fell into place. Good Samaritans became Obsessive Fans, Ship Captains who carry news from port to port became Groupies, members of the court became Members of the Band, the Fool/Wordsmith became the Songwriter and the Steward becomes the Band Manager. I believe this setting helps to translate to a modern audience where the power lies and why the relationships grow they way they do in the original text. The last thing to address is the choice to cast the traditionally male role of Malvolio as a woman. The 1980s were a tumultuous time for the homosexual community, where homosexual orientation was still viewed by many as a mental illness and, with the discovery and rise of AIDS, became a topic that was focused on publicly for the first time. I saw a connection between the class-based disdain for Malvolio in the play, and the discomfort people showed for alternative sexualities even 30 years ago, and wanted to see where the context of the play would lead us with casting in that direction. At the Illyrian Music Festival, Orsino is heartsick for Olivia, who is in mourning and refuses to see anybody. Orsino sings broken-hearted love songs, assisted by his backup singer/dancer Curio. The tour bus carrying Viola and Sebastian, a twin brother-sister act, crashes. Viola survives, and in her grief at the loss of her brother disguises herself as a boy named Cesario. She joins Orsino as a servant, but finds herself attracted to him. Orsino sends her to woo Olivia in his stead, who finds herself more attracted to the boy than to the man. She turns Viola away, but then sends her uptight band manager Malvolio after “him” with a ring. The love triangle is complete: Orsino loves Olivia, who loves Viola/Cesario, who loves Orsino. Olivia’s group is a rowdy bunch: her uncle and hanger-on Toby Belch, her drummer Andrew Aguecheek, her friend Maria, and the songwriter Feste, who party all night and sleep all day. The uptight Malvolio chews them out. They devise a plot against Malvolio: they forge a love letter from Olivia to Malvolio and leave it where it can be found. The forgery claims Olivia wants to see Malvolio dress up silly, and when she does so, Oliva rebuffs her. She thinks Malvolio’s odd behavior is a sign of impending insanity. Malvolio is locked up, and further tormented by Feste and Toby. Meanwhile Viola’s brother Sebastian has survived the crash, unknown to Viola. He wanders toward the festival. He is followed by his friend Antonio, who must take care as he has previously fought with Orsino. Andrew is also in love with Olivia, and Toby pranks both him and Viola. He tells each the other wants to fight. Reluctantly, they do. It’s interrupted by Antonio, who mistakes Viola for Sebastian, and Antonio is hauled away. They then meet the real Sebastian. They are perplexed, but figuring him to be a pushover, they challenge him (again, they think). They are promptly bested, and run away. Sebastian encounters Olivia, who mistakes him for Cesario. Sebastian is surprised by the sudden attention and affection, but is swiftly wooed, and run off to a priest to be married. Olivia and Orsino finally meet, and the plots unravel. Olivia, believing Viola is Sebastian, calls her “husband”. Andrew and Toby, also believing Viola to be Sebastian, accuse her of beating them up. Feste brings a letter from Malvolio to Olivia, which is angry but clearly sane. Malvolio shows the letter that she received, and Olivia recognizes that the hand is not her own. The plots are confessed, confusions are cleared up, and everybody lives happily ever after. Disclaimer: Rude Mechanicals provided two complimentary media tickets to ShowBizRadio for this review. This article can be linked to as: http://showbizradio.com/go/9482. Pumpkin Theatre Seussical the Musical Jr.